Presenting collections of ebooks in the form of boxed sets can be a great way of boosting sales, especially when offering them at a bargain price. For self-published authors with more than one book available, combining a series into a box set costs next to nothing to do – you just need to create a picture of a virtual box, and add it to your usual distributor websites with an appropriate blurb and price. Another approach that can be especially effective is to collaborate with other authors in your genre to create a box set sampling one book by each of you. Each author in the group promotes the set, thus bringing your work to a wider audience. You can either make this a long-term offer, or present it just as a short promotion. But however you do it, the more effort you put into marketing your box set, the better it’ll do. Today I’m delighted to introduce a stunning box set of great novels by an excellent band of women writers who write literary fiction that doesn’t fall neatly into any one genre – hence the title, Outside the Box (which I’m pleased to say I dreamed up for them in an online discussion one day when they were first mooting the project!) Priced £7.99 / $9.99, this represents excellent value for seven full-length top quality indie novels. I’ve read two of them already, and can’t wait to read the rest! Debbie Young: Why did you decide to do a box set with other authors? Roz Morris: For me, these writers are the real superstars of self-publishing. They’re storytellers dedicated to their craft, who have proved their worth with awards, fellowships and, of course, commercial success. Each author here is in charge of her own artistic destiny, embracing the indie path as a statement of integrity, yet writing fiction that speaks to everybody. I’m utterly proud to be included. We’ve already been interviewed by The Guardian books pages, Books + Publishing (the Australian counterpart of Publisher’s Weekly) and have interest from the arts programmes of BBC Radio 4. If any of us had approached them on our own, we probably wouldn’t have got even a reply. But together? 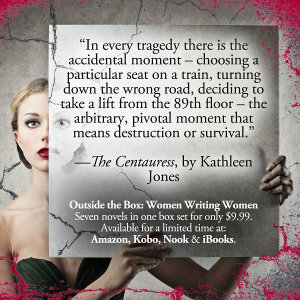 Kathleen Jones: I’m loving the idea of being with a group of women writers whose work I like and respect. Also intrigued by the contrasts and resonances that are set up when you put seven very different books and authors together. You know your work is going to be read by readers who wouldn’t normally have bought it. There’s an edge to that – are they going to like it? Hate it? It’s very exciting. Joni Rodgers: Indie publishing is the new high ground for ground-breaking fiction. Maybe this is a US thing, but publishers here have gotten more and more gutless. Authors are pressured by agents and editors into tropes and style that sell — and that’s not a healthy state for the artists individually or the art form at large. Readers will find the true artistic risk-takers and creative outliers in the indie world, where we captain our own fate – as artists must. Debbie Young: How did you choose which authors to partner? Jessica Bell: The main reason I approached these fabulous ladies to collaborate in a box set is because I admire their work, and adore them as individuals, and I couldn’t imagine collaborating with a finer group of writers. Each author in this box set are at the very top of her game; each book representative of quality fiction that explores a diverse range of unlikely heroines. I must say, I’m a little bit of a fan girl, and I can’t believe I have the pleasure of taking part in this project. It really is a dream come true. Jane Davis: When Jessica approached me, I had already been laying some groundwork for a project of my own. It made perfect sense to work together. We looked for authors whose work we knew had been pigeon-holed to their detriment by traditional publishing, or whose work is difficult to define by traditional parameters. My second novel was turned down by my publisher because it wasn’t women’s fiction – they had published Half-truths and White Lies under their Black Swan imprint, but I had never set out to write only for women. Roz Morris describes My Memories of a Future Life as ‘stubborn and strange’, which I think is a fabulous marketing strategy. Like Joanne Harris, I challenge whether ‘women’s fiction’ is a genre. At a time when bookshops have been asked to do away with ‘boys’ fiction’ and ‘girls’ fiction’, this category seems highly inappropriate. We are told that women read books by men and women but men only read books written by men. There is an irony here. Two of the authors within our collective ghost male authors. Whether they realise it or not, men are unwittingly reading books written by women. Carol Cooper: This is a small group of acclaimed indie authors whose work I hold in the highest regard. I love their varied ways of telling a story, and what each of them has to say about the lives of women. What unites the writers is their desire to craft their fiction to be the best it can be. When Jessica approached me with her vision of who some of the central authors might be, it was a no-brainer: I wanted to be with them. The exact choice of collaborators evolved over the next few days and weeks, and we each had input. I know this set of books will be thought-provoking and hugely entertaining. But there isn’t a category for that. Debbie Young: Did you all read each others’ books first – and was there a power of veto to turn someone down?! Jane Davis: I hadn’t read all of the books that appear in the box-set first, although I had read other books written y the authors. I got to know several of the contributors by interviewing them for my blog. For example, I discovered that I shared a love of the Lake District and of art and photography with Kathleen Jones (author of The Centauress). In fact, both of us draw heavily on art in our fiction. Decisions were made democratically, but there were no disagreements about who would be a good fit. The final line-up were then asked to nominate their novels that best suited the theme of Women Writing Women. And we’ve ended up with an extraordinary cast of unlikely heroines. In fact, some of our heroines are precisely the type of women traditional publishers would shy away from – which perhaps explains why our set of authors have found their home in self-publishing. Joni Rodgers: I actually met Roz, Orna and Jane’s books before I met them, which is probably the best possible way to make friends with another author. I read and loved Orna’s linked novels After the Rising and Before the Fall and learned about her life as a publishing industry mover/shaker when I was searching to see what else she’d written. She turned me on to Roz’s book My Memories of a Future Life, which I inhaled one weekend when I was down with the flu. When I learned Jane Davis’s An Unchoreographed Life would be in this collection, I’d already bought it for a traveling Kindle I share with my daughter. We load it with books we both want to read and discuss, and that haunting cover image—who could resist? Debbie Young: How long did it take to plan it? Jane Davis: The project came together surprisingly quickly. Because of the range of talent within our team – people who are used to being in control – within a week we had a title for the box-set, cover artwork and a website and those elements really strengthened our vision and spurred us on. Debbie Young: How are you going to promote it? Jessica Bell: As well as approaching major international media outlets, we have set up a few blog tours and author interviews on various reader and writer websites. The box-set is only available for 90 days, and at a whopping 75% percent off what it would cost to buy the books individually. If someone posts a review on Amazon, Barnes & Noble or Kobo, all they have to do is flip us a link using a form on our website (womenwritewomen.com), and as a thank you, we’ll email them a digital swag bag that includes a free book, plus lovely links, delicious downloads, and some playful surprises. And just for stopping by, they’re welcome to a free download of a custom Facebook header celebrating women authors who inspire us. We’ll be posting a new header every Sunday while the box set is available. Jane Davis: This box-set is a showcase for the vast range of subject-matter that women writers are tackling. Self-publishers have to choose from a sometimes bewildering range of genres at the point of publication, among them women writers and fiction, women’s literary fiction, literary fiction, women’s popular fiction, contemporary fiction, general fiction. And the diversity under those categories is so vast that these labels lose all meaning. Cover design has become very misleading. It’s difficult for readers to know where to find their next read. Inevitably, some books end up in the hands of the wrong readers. Personally, I find the sub-genres far more useful. Joni Rodgers: The indie publishing revolution rewrote the balance sheet and brushed aside the crowd of people who used to stand between author and reader. Less than ten years later, we’re living in a totally new publishing universe where quality fiction is on the rise, because it’s created within the artistic values systems of authors rather than the commercial values systems of corporate publishing. The challenge for indies—as it always has been for corporate publishers—is connecting book and reader. It’s personal. That’s why indie collections like Outside the Box work so well for both readers and authors. I love stepping aside from the noise and introducing books I can highly recommend to readers who really get it—and not everyone does. These aren’t the commercial no-brainers; they’re the thoughtful books that jump the turnstile and do all sorts of things that well-behaved books don’t do. Debbie Young: Do you have one lead person in charge, or do you all have an equal say/equal workloads/responsibilities? Jane Davis: It has been very democratic. We have a very experienced team of self-publishers. I think it’s fair to say that we all play to our strengths and know how we can best contribute. Individual tasks are posted on a secret Facebook page and we sign up for them. It has been wonderful to have someone who designs book covers and interiors spearheading the project. These are things that authors ordinarily outsource to experts at considerable expense. The website has been created by Joni Rodgers – who just happened to own the domain name – and the video is also her work. I arranged a blog tour and a twitter campaign and wrote the press releases. Roz and Carol have been using their media contacts and have been blogging like mad, and so on. So yes, the workload is shared out – although this week Jessica has been burning the midnight oil getting the e-book ready for upload. Debbie Young: You’re doing it for a set time frame of 90 days – how did you arrive at this? Might you extend it if it’s still selling well? Jane Davis: Part of the appeal of the product is that it is a limited edition. I think it would be a pretty mean strategy to say, ‘Available for 90 days only, buy your copy now’ and then extend the timescale. Besides, some of our authors only have one or two novels to their names and it isn’t fair to expect them to offer such heavily discounted prices in the longer term. Debbie Young: Do you have other plans to collaborate, or is this a one-off? – I’m thinking once you’ve targetted each other’s audiences, maybe the next step is to separate and repeat with other partners. Jane Davis: I already have another collaboration planned for the year ahead – although I have to say that it isn’t on the same scale. I would like to make some time for writing! Carol Cooper: I would love to collaborate on another project soon, but the reality is more humdrum: I will be co-authoring non-fiction for the next few months. 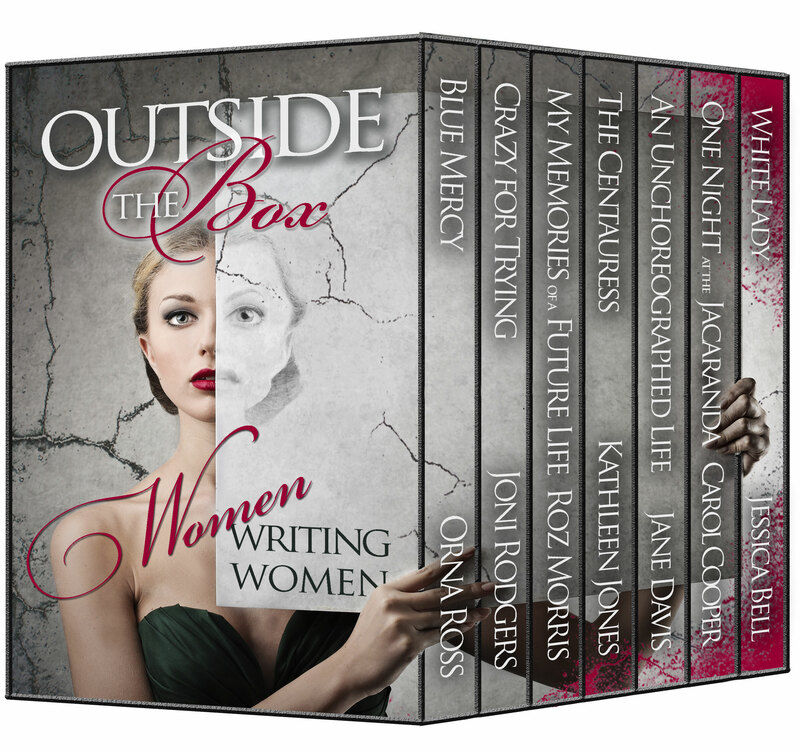 Working on Outside the Box with my fellow authors has been a fantastic experience. I’ve co-authored many books before, and it’s not the same process at all. The co-authoring has been a necessity, while OTB is more of a dream come true. As well as being more fun, it has also been more creative, partly because each of the authors has such distinctive opinions and experience. Debbie Young: Usually box sets are in the same genre e.g. gritty thrillers or chick lit. I’ve read two of the books in the set, and they were very different – and I had three more of the already on my to-read list, and my perception is that all 7 are very different, similar only in quality. Does that weaken or strengthen your proposition? Jane Davis: I think it’s an incredibly strong set of books without borders. I don’t insult my readers by assuming they only like to read one type of fiction. Visit any book club and you’ll see that readers welcome variety. We won’t be insulting any readers with Outside the Box. Within this set of seven novels, we offer the full spectrum from light (although never frothy) to darker, more haunting reads that delve into deeper psychological territory. We hope to take some readers outside their comfort zones, perhaps tempt them to take risks on book that they might have otherwise overlooked. Carol Cooper: I absolutely agree with Jane about these being books without borders. The common theme is the lives of women (and inevitably this has roped in some men, as well as children and animals…). I would be seriously upset if anyone were to suggest you can only tell those stories with one voice or in one style. Here’s the link to order your box set from Amazon US or from Amazon UK. Like me, all seven of the women involved in this project are members of the Alliance of Independent Authors, the global organisation that brings together thousands of indie authors from all around the world who are self-publishing to professional standards. To find out more about joining ALLi, click here.